Fred Trump was born in New York in 1905. President Trump on Tuesday said his father was “born in a very wonderful place in Germany,” even though Fred Trump was born in New York. The president was speaking with NATO Secretary General Jens Stoltenberg at an event at the White House on topics including defense spending by European countries. Trump repeated his frequent complaint that countries such as Germany weren’t spending enough, but added he still has respect for Germany as an ally. Trump just said "my father is German, was German. Born in a very wonderful place in Germany." Fred Trump was born in New York. The president’s father, Fred Trump, was born in the Bronx in 1905. You can see his birth certificate here, or you can just Google it. But for some reason, the president keeps saying his father was born in Germany. The White House did not immediately respond to a request for an explanation. In July 2018, the president told Fox Business Network’s Maria Bartiromo that both his parents were born in the European Union in an interview about trade with Europe. His mother, Mary Anne Trump, was born in Scotland. That same month, he spoke with CBS News, calling the EU a foe of the United States because of trade, not any personal ill will toward Europe. The president made similar statements at a press conference in Brussels later that month. 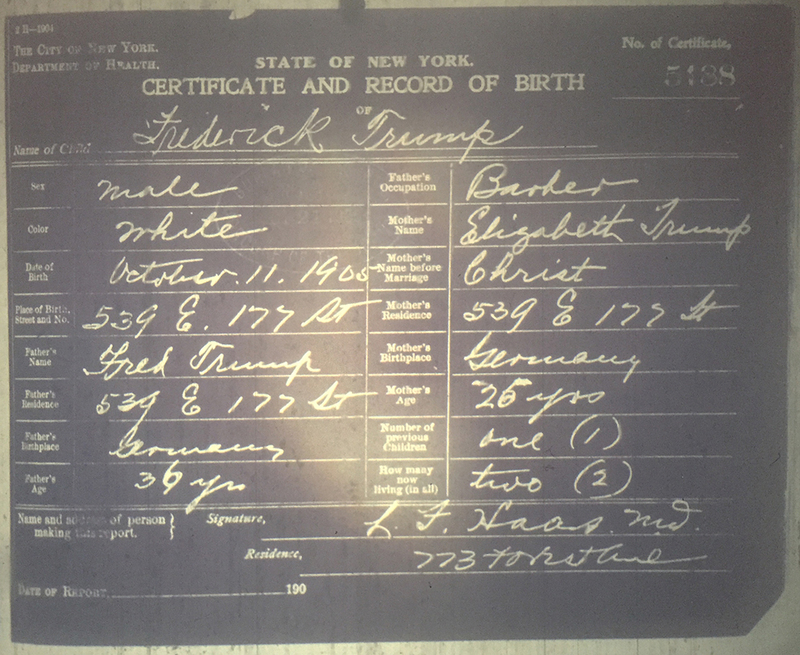 The president does have German ancestry: His grandparents Frederick and Elizabeth Trump were born in Germany and moved to New York after they were married. But the president hasn’t always been up front about those origins either. In 1987’s Art of the Deal, Trump wrote that his grandfather had come to the US from Sweden as a child. Claiming Swedish, not German, roots was a long-running lie within the family, the New York Times reported in 2016. Germany was unpopular during and after WWII, the president’s cousin John Walter told the New York Times, and the lie was good for the family business in Fred Trump’s mind. “He had thought, ‘Gee whiz, I’m not going to be able to sell these homes if there are all these Jewish people,’” Walter told the Times.